As ISE underwent its final preparations yesterday ahead of this morning’s opening, we spoke to Mike Blackman, managing director of Integrated Systems Events, about some of the challenges involved in putting on a show that gets bigger every year. Of all the issues any MD would like to face, managing growth probably comes high on the list, and one that Blackman obviously relishes. This year’s show will be 20 times the size of the first, and that’s a source of pride for him. Blackman notes that this year will see some 16,000 first-time visitors, and he expects overall attendance to be up around 10 percent. The number of companies wanting to be part of ISE has also grown, which means that ISE now boasts a 15th hall. He revels in the fact that the growth in ISE reflects growth in a very vibrant industry—an industry of which it seems everyone wants to be a part. Blackman is, however, convinced that technologies like XR—an amalgam of VR, AR, and MR—will become integral to the industry. 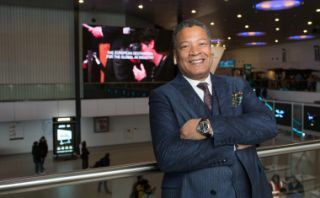 In the same way that ISE is focusing on ensuring that it has the right kind of exhibitors, Blackman is also keen to grow the quality, rather than the quantity, of visitors. “Our exhibitors want to see more end-user decision-makers coming through the door, and that’s what we’re trying to deliver for them,” he noted. Yet another challenge Blackman is trying to resolve is smoothing the flow of visitors across all four days of the show—making for a better experience not only for attendees, but also exhibitors. That means holding some high-profile events, like the final and awards ceremony of the World Masters of Projection Mapping competition, toward the end of the week.